Газовый клапан Honeywell серии V5055 в наличии на складе, доставка по России. Use with natural or LP gases. Mount directly in gas supply line. Include 1/4 in. NPT upstream and downstream taps and plug. 4 in. models have only flanged connections. V5055 normally closed valves are rated for final shutoff service safety shutoff. 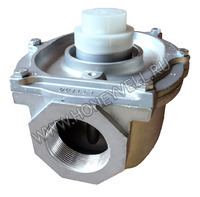 V5055A,C,D,E Valves are for On-Off service. V5055B Valve has a characterized guide and in combination with the V4055, V4062, and V9055 Fluid Power Actuators, provides slow-opening, hi-lo-off, and modulating functions respectively. V5055C,E,F Valves have a double seal and are used with V4055D,E Actuators to provide proof-of-closure switch and valve seal over-travel interlock. V5055D,E,F Valves are for high pressure applications. Вы можете купить газовый клапан Honeywell V5055, сделав заказ через корзину интернет-магазина.